I have never been a fan of the cheap white plastic blinds everyone has in windows, they drive me nuts! I think the blinds in our house are the same ones that were put in when the house was built 15 years ago. They are kind of yellowed and brittle. Our cats like to jump up in the windows and so pieces would break off. We've slowly been changing them for new ones as they've gotten really bad. I finally received some faux wood Blinds from www.blindschalet.com and they are gorgeous! I got the 2" cherry color and they are exactly what I wanted. 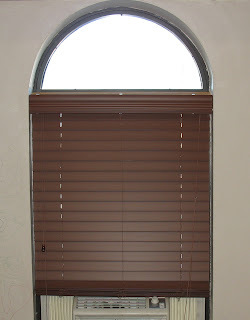 They were easy to order, simply measure your window and they can custom make your blinds to fit. There are a ton of types to chose from too. I chose the faux wood because I figured it would be easier to care for than real wood and not warp from the dampness that our window a/c sometimes blows on them. Installing them wasn't too hard by following the directions online. It only took about 15 minutes for me to put them up. Hubby was busy working on the car so I did it all myself and it really was easy. The only part I was confused on was the valance clips, I wasn't sure how they went on, but once I figured it out it was a snap. Once I got them up I stood back for a look and they look perfect! I really love them and want them for my whole house now! They block out light much better than the cheap blinds we had up there before, and the movement is really smooth. Next I want to order some for my bedroom. Aren't they gorgeous?! And they are long enough that when the a/c is out during the winter they go down all the way. I will definitely buy from Blinds Chalet again. Aren't they awesome! You got the same blinds I did. They really keep the sun out so well. They're beautiful! I can't wait to install mine! Wow Kara those look good! How fun! Arg, I just want to scream!